Aviation Seals for Cessna, Piper and more! MROs, Flight Schools, and aircraft maintenance facilities trust Brown Aircraft Supply to provide them with the finest in aircraft seal and gasket choices. Tight seals last longer and ensure a proper fit to aircraft. Our 50 years of experience in manufacturing and supplying aircraft seals means we understand the complexity of a variety of models. Our selection of aircraft door seals, window seals, wing root seals, and variety rubber and silicone high-temperature seals is unmatched by any other supplier or distributor. From Cessna door seals to window seals for Piper aircraft, we offer a full range of aviation seals to meet your needs. 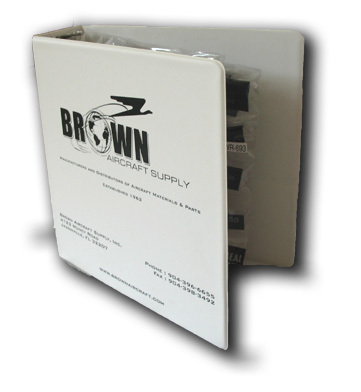 Our BA-100 sample kit is a staple at many repair, maintenance and paint shops in the aviation industry. This sample kit allowing mechanics to quickly match and locate the aviation seals they need for proper repairs, allowing them to order parts with confidence and provide the highest levels of fit in their repairs. Our experience also allows us to offer custom aircraft seal and gasket products. Call us at 904.396.6655 or contact us at makeasuggestion@brownaircraft.com for information on how we can fulfill custom aircraft seal orders. The sample kit contains a 2 - 3 inch sample of approx. 130 different samples of the seals that we stock and carry. They are all labeled with a part number so it makes it easy and simple to get what you want.